Meet your neighbor, Scott Floyd, of Carthage and a candidate for Hancock County Sheriff. 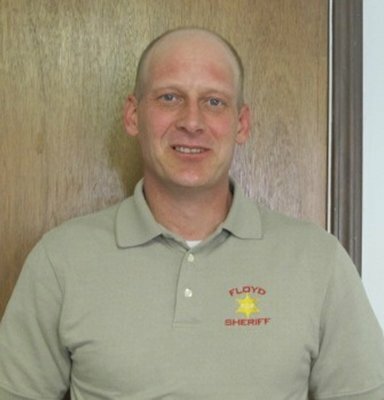 Scott is the Chief Deputy for the Brown County Sheriff's Office. He is also a Versailles Police officer and a part time police officer in Mt. Sterling. Scott was born in 1969 in Macomb and was raised in Plymouth. His parents are Mike and Ada Johnson formerly of Blandinsville and Jerry and Ruth Floyd formerly of Nauvoo. He was surrounded by law enforcement as Jerry and Mike were both police officers as well, with Mike being the former McDonough County Sheriff. Scott's grandparents are Louie and Geneva Daniels of Plymouth. Scott's siblings include brother, Jerry Johnson of Blandinsville, and sisters, Angie Mormon formerly of Plymouth and Christy Floyd and Julie Floyd both formerly of Nauvoo. Scott has two daughters, Alura and Ara Floyd both of Carthage. Alura is 13 and Ara is 10 and both girls attend Carthage schools. Scott is engaged to Kari Johnson, formerly of Nauvoo. He graduated from Plymouth High School in 1988, in a graduating class of about 19 students. Scott went into the military after high school and was involved in the Persian Gulf War. He attended Western Illinois University for one year, majoring in Law Enforcement. He then went on to the Illinois Police Training Institute and received his Law Enforcement Certificate. His previous employment includes Deputy Marshall of Nauvoo in 1993. He then moved to Carthage as a patrol officer and was the assistant chief of police and the Chief of Police. Scott has received numerous achievements and medal during his military career and his career in Law Enforcement. He has received the Bronze Star Medal, Southeast Asia Medal, National Defense Service Medal, and the Humanitarian Award Medal. He has also received 4 Police Commendation Medals, 5 Civic Achievement Police Awards and 2 Police Certificates of Appreciation. Scott also has a lot of training in numerous fields of his career. Scott was instrumental in helping start the Carthage D.A.R.E. Program. He has been a Certified D.A.R.E. Officer for the last 17 years, teaching 3rd and 5th grades. He is also trained as an FBI Hostage Negotiator, Crime Scene and Homicide Investigator, Sexual Assault Interviewer and Investigator, Domestic Violence Investigator. Scott is also a Certified Juvenile Officer and a Certified Narcotics Officer. Scott loves to hunt and fish and is a member of the VFW. He also loves to spend time with his girls. One of his most favorite memories is doing the sound and light shows with brother Jerry and the late Murray Mershon. He says "Being involved in Law Enforcement my entire life, I'd love the honor of bringing my training and expertise to the citizens of Hancock County. As Sheriff, I believe it is important to effectively manage the taxpayers' dollar so they receive the highest quality service, professionalism and technology available."